However, lumbering SUVs are impractical for small families. Why spend more money on seven seats if all you need is enough room to accommodate three of four grown adults? If you still want a sedan but require the year-round all-terrain performance of all-wheel-drive, you have come to the right place. Here are the 2018 best AWD or all-wheel drive sedans you can buy for under $40k. The Subaru badge is synonymous with symmetrical all-wheel drive. It is the only one in its class equipped with standard AWD. It is also available in sedan and hatchback body styles. The 2018 Subaru Impreza sedan comes with plenty of standard features in base trim. It’s got a remote lock/unlock system, 16-inch wheels, a rearview camera projected via a 6.5-inch touchscreen interface, Bluetooth, Android Auto and Apple Car Play, cruise control, and a 60/40 split folding rear seat. All trim models of the 2018 Impreza are powered by a 2.0-liter Boxer four motor that produces 152-horsepower and 145 pound-feet of torque. The engine is mated to a somewhat syrupy and lackluster CVT transmission. It’s not the fastest sedan in this list, but the Subaru Impreza with standard AWD can achieve a sterling 32 mpg in combined city and highway driving. Prices start at only $18,595. It’s a pity Ford will ditch all their sedan offerings to focus solely on SUVs, trucks, and crossovers. The 2019 Ford Fusion is an excellent choice for a midsize sedan. It’s not a compact similar to the Impreza, but it offers more room, sporty styling, and an optional all-wheel drivetrain if you choose the Titanium and Platinum trim. All-wheel drive comes standard on the V6 Sport trim. The 2019 Ford Fusion Titanium comes with 18-inch wheels, power-adjustable front seats, a banging 12-speaker Sony audio system, dual-zone climate control, rear parking sensors, LED headlights and taillights, and a magnificent 2.0-liter turbocharged engine that produces 240-horsepower and 270 pound-feet of torque. The 2019 Ford Fusion is simply one of the best and most affordable family car and sports sedan that money can buy. Prices for the 2018 Ford Fusion Titanium with AWD starts at around $35k. The Kia brand has come a long way. From humdrum compact cars to sporty crossovers that deliver excellent value for money, we now have the 2018 Kia Stinger. Just look at it. From the styling alone, you’ll know it’s going to be one hell of a ride. 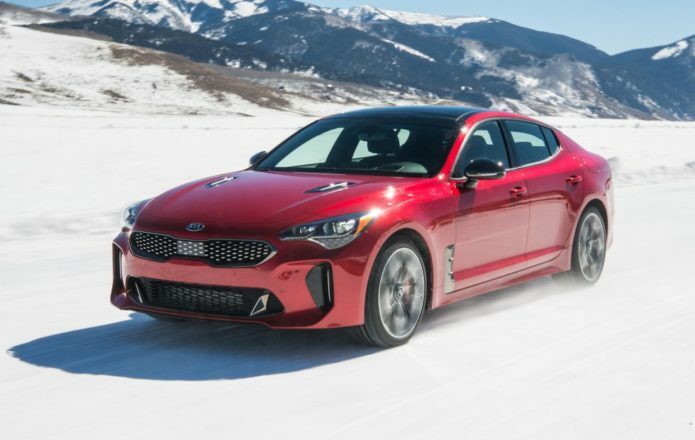 As an added plus, all trim models of the Kia Stinger can be equipped with an optional all-wheel drivetrain. The base model of the Stinger comes well-equipped with automatic headlights, LED running lights, front and rear parking sensors, leather upholstery with heated front seats, keyless ignition, dual-zone climate control, a 7-inch touchscreen interface with Android Auto and Apple CarPlay, a six-speaker audio system with satellite radio, 18-inch wheels, and a powerful turbocharged 2.0-liter four banger with 255 horsepower and 260 pound-feet of torque. The engine is mated to a slick 8-speed transmission. What’s great about the Stinger is how it feels when driven. It handles gracefully and turns with utmost precision. Oh, and you can get an all-wheel drivetrain for no more than $34k. For those who want nothing less than a muscle car masquerading as a sensible and relatively affordable family sedan, only the 2018 Dodge Charger will suffice. The bad news is you have to skip the base SXT trim and go straight to the GT trim to get an all-wheel drivetrain. However, the good news is the GT trim comes with a bevy of standard features for not a whole lot of money. The 2018 Dodge Charger GT is equipped with 19-inch wheels, Uconnect multimedia system with an 8.4-inch touchscreen display, heated front seats, a premium audio system with 6-speakers, keyless entry, rearview camera with parking assist, remote start system, and traction control with stability control. Power comes courtesy of a high-output 3.6-liter V6 motor with 292-horsepower and pound-feet of torque. Also available is a 5.7-liter V8 with 370-horsepower and a 6.4-liter V8 mill with 485-horsepower albeit at higher trim models. The 2018 Dodge Charger GT with AWD starts at around $33,000. If you are buying an AWD sedan for the driving experience, take a closer look at the 2018 BMW 3-Series. There’s no doubt the 3-Series is still the gold standard for sport sedans, but it also happens to blend ample amounts of refinement without breaking the bank. The new BMW 3-Series is available in sedan and wagon body styles. All trim models can also be equipped with the xDrive all-wheel drive system. The base 320i is powered by a 2.0-liter turbocharged engine that produces 180-horsepower and 200 pound-feet of torque. The engine is connected to either a six-speed manual or 8-speed automatic transmission. Standard equipment includes push-button start, dual-zone climate control, Bluetooth, automatic wipers, iDrive interface with a 6.5-inch display, and a premium nine-speaker audio system. Our only caveat with the BMW 3-Series? Ticking the options box will require you to empty your bank account. Thankfully, the base 320i will only set you back around $37,000.